My original ships hit the living room floor as my son makes up rules for his 'ship game'. Strictly speaking 2017 ended in a bad place for me. The game project I was working on collapsed and the studio was dissolved just a few days before Christmas. Thanks to some close friends, I was able to line up some contract work that saw me through the next few months, but it was nevertheless a difficult time for me. Unable to focus, I gave up on hobby activities, and for the first time in my life I wasn't sure if I ever wanted to pick them back up again. During the holidays I started sifting through my stuff in the garage looking for what I could cull from my collection to help cover bills. My son, Theo, was hanging out with me and pointed to a little box in the garage, wanting to know what was inside. I pulled it down from the shelf and opened it up. Inside were a dozen or so little wooden ships that I had made in my university days. He wanted to play with them, so we took the ships inside. I got to use D6, but Theo got a D20, because his ships "were better". Theo has a very curious mind. He asks a lot of detailed questions and whats more he retains it. So he wanted to know everything about these little ships. I told him that they were called dreadnoughts, huge battleships with lots of armor and big guns. He wanted to know which were the goodies and which were the baddies, so I told him about the British and German fleets during World War I. While he played with them I started reminiscing about those ships. I had built them in 2006, during another hard time in my life as I struggled with my masters degree at university. 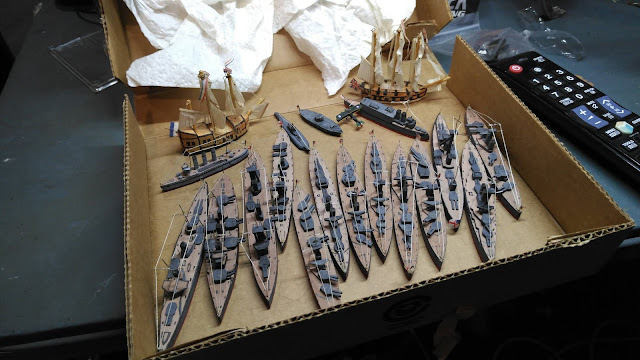 One night I couldn't sleep, so I got up one night and saw my Jane's Ships of World War I on my bookshelf. I grabbed it, thinking a little technical information might send me to sleep. I flicked through to HMS Dreadnought and started looking at the little 3-view plan and I thought that I could make that. So I grabbed some balsa and built it from scratch. I didn't pay any mind to the scale or trying to get super detailed with it. I wanted to engage my creative side and just make something. So I did. The box with my old ships. 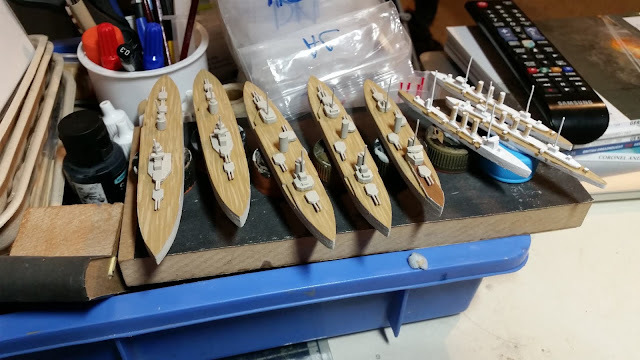 Over the next few nights I made even more ships, this time a few of the dreadnoughts from Jutland, the seaplane ship HMS Engadine (and a Short 184 to go with it), the famous SMS Emden, and even a German submarine. I also built the ironclad USS Monitor, a 17th Century trade carrack, and a 19th century British frigate. By the time I had completed those, I had literally built myself out of the slump I was in and got back to work and study. As I thought about all of this, it hit me that that's exactly what I needed right then. I needed that sort of project to help me through those terrible final days of 2017 and into the new year. So I grabbed Theo and we were off to the hobby shop to get some balsa. Biting off a squadron at a time makes the process a lot easier! I needed to define the parameters of this project and this meant setting out a goal. 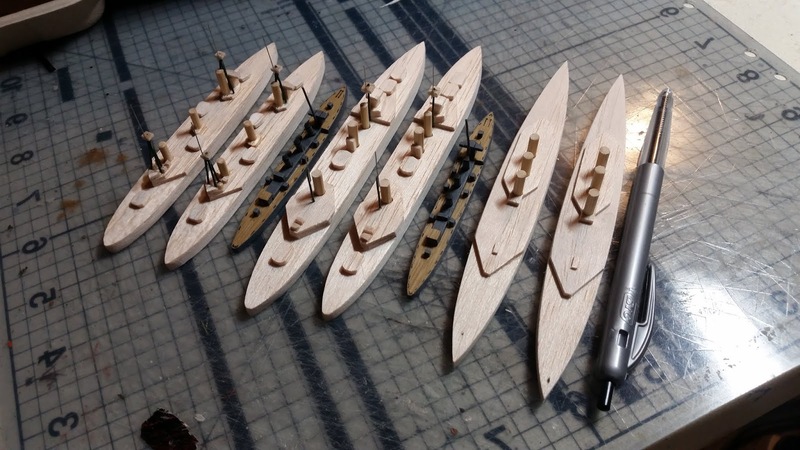 One of the goals I wanted to achieve in 2006 was to build all of the ships at Jutland, at least all of the dreadnoughts anyway (there were like 200 ships involved). I stopped at 14 dreadnoughts when my attention was pulled away. At the time I was only building for building's sake so my commitment to finishing that goal was only so deep. However, here 11 years later things were different. First I had been painting models for wargames for over a decade at this point, so scale suddenly held more significance than it had before. Second, I was aware that I could use these models in games other than just static pieces. Third, I wanted to improve on the craftmanship of those earlier models and come up with better solutions to various aspects. Finally, while my 2006 Jutland goal seemed lofty, it was important to me as it gave me focus and it connected me to my earlier project. To do this, I needed to measure expectations and plan out my art style for the project. 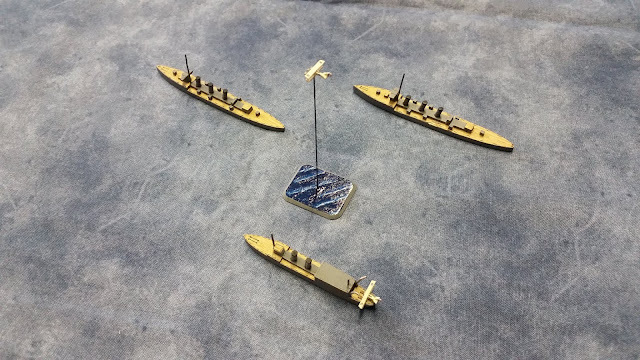 By keeping the models' aesthetics in sync with the simplistic line drawings in Jane's World War I ships, I could produce low-fidelity models at a much higher rate than if I got hung up on detail. 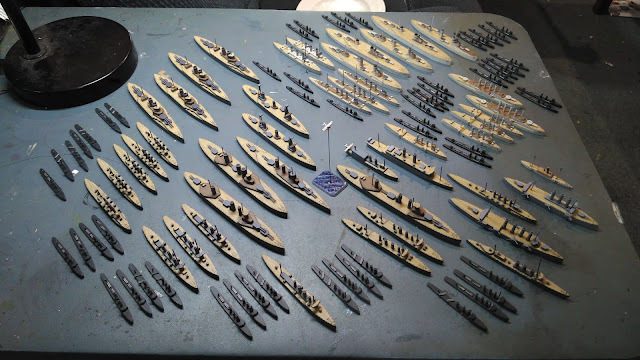 So that was the plan: all the ships at Jutland, at a scale to be determined, with an eye toward using them in wargames in the future. 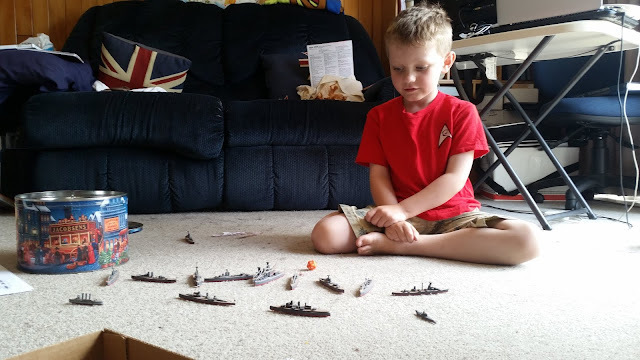 Theo plays with some of my new ships. I deliberately chose not to build with any particular game in mind. It was important to me that this project only took on those pressures that I set on it myself. I didn't want game systems to put constraints on my project, such as base sizes, etc. This also freed me up to not worry about getting these ships done to some arbitrary deadline. Sometimes I get hung up on speeding to a painting deadline because I want to play a game or something very soon. I've found that this sort of race to the finish can often drain motivation as well as resulting in less than amazing results. So by freeing myself of those artificial pressures, it was time to apply my own meaningful ones. I chose the scale of my ships by thinking first about the smallest ship I wanted to portray in the project. I debated about including destroyers in the project as nearly half of all the ships involved were there tiny little ships. 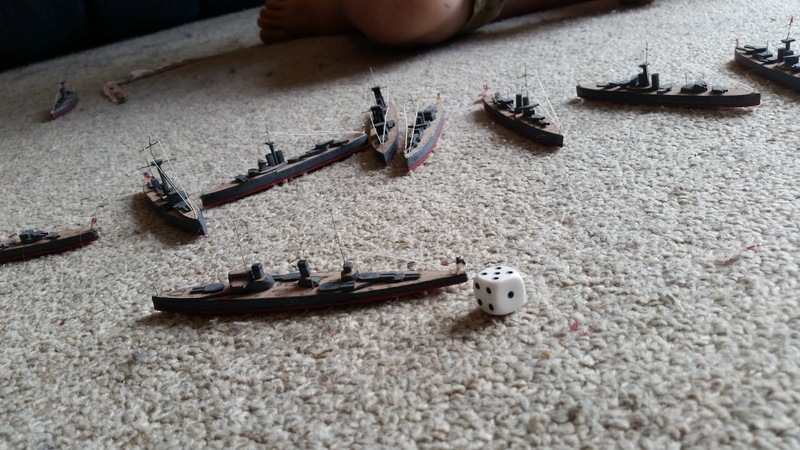 But in the end I decided to include them because they played important roles in the battle and to leave them out would be to cut out a big part of the story of Jutland. 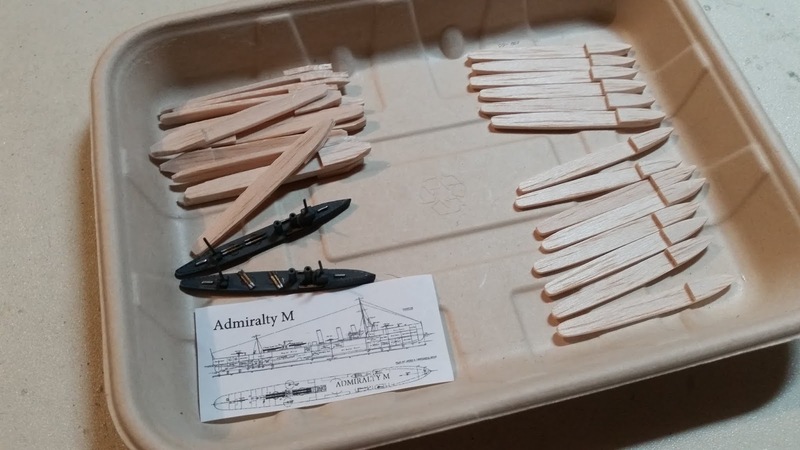 With that decided, I simply measured out how big I wanted my destroyers to be and then rounded that measurement to the nearest number, settling on 1:1500 scale. Build order was also important. 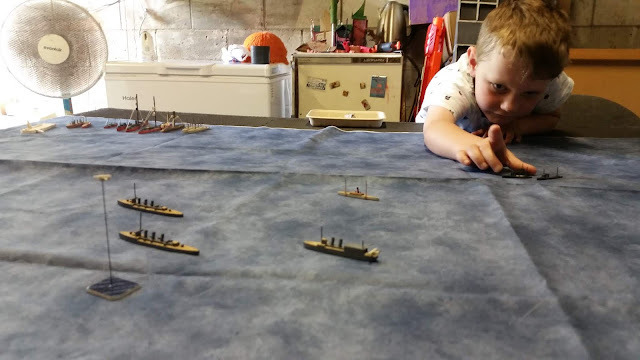 I wanted to dive right in as I had done with my last batch of ships starting with HMS Dreadnought (which wasn't at Jutland). I then did a random collection of ships after that. With this project I wanted to do complete squadrons before moving on to the next. I also had the idea of going chronologically through the squadrons in the order that they each entered the battle. So that meant I needed to focus on the battlecruiser fleets first and then the dreadnought fleets. By locking my order chronologically it gave me some easy milestones to work towards. With the scale and the build order established, I got started. I scanned, scaled, and printed off all of the plans I was going to need for the project out of Jane's Ships of World War I. Next I cut out all of the hulls. All 200+ of them... I put all of the like ship-class hulls and their plans into plastic bag to keep them tidy and organised. From that point I could just grab what I need and get started. First contact, from the British side. After a few nights, I managed to finish up the first few ships done that kicked off the battle. And the neutral Danish steamer, N J Fjord. which was the ship that brought both fleets together. Just like last time building these little ships helped me through a hard time. They gave me focus and a creative outlet. Thinking back on this, I attribute the sustainable success of this hobby therapy to being able to set my own parameters for this project. So if you're looking to get out of a hobby slump, my recommendation is to pick a project that means something to you, set out the parameters yourself, reject external pressures, and take it as far as you feel like. And the progress goes on! I'm still plugging away through my Jutland project. So far I've completed both battlecruiser fleets as well as a small detour into the south Pacific to cover all of the ships at the Battle of Coronel. Last week I got started on the dreadnought fleets, so we're half way through! A very positive and useful post. I've used my hobby in a similar way, and I think there is a lot to be said for being creative, having achievable goals and having something you can step back and see finished. Excellent post mate, glad you worked your way out of a bad place. Been there a couple of times myself and just coming out of one recently I really identify with this post especially the bit about letting game rules etc getting in the way of a creative process. Thank you for sharing the creative inception of this project. I look forward to reading updates. While we all like to look at pictures, sometimes the personal stories behind them are the real payoff. I'm glad to see your son getting involved, too.